Note: I would like to share with you through these few words, photographs and hyperlinked websites, a 3 Dimensional experience as though you were actually there with us. Click on any photograph and it should enlarge to a different size ….. at least half screen or size full screen. It will be clearer in detail than the photo on the post. It will be as if you were really there looking at the actual scene. You are an arm chair traveller with us. If you would also like to see the post in a larger or smaller size, I suggest you follow this procedure: If you right-handed, with your left hand, press down continuously on the Control Function Key with your left hand and with your right hand, move the little cursor wheel either forwards or backwards to make the text in the post larger or smaller. 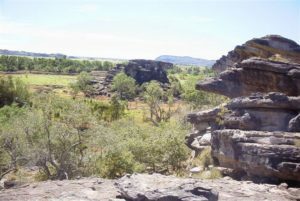 Then went down to Kakadu National Park for four days … a Park of rivers, floodplains, cliffs and Aboriginal rock art etc. over hundreds of square kms. 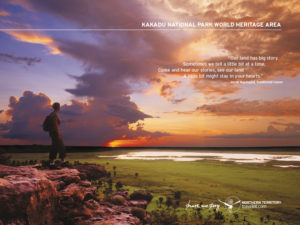 World Heritage-listed Kakadu National Park is a place of rugged escarpments, lush wetlands and cascading waterfalls covering over 19,000 square kilometres. 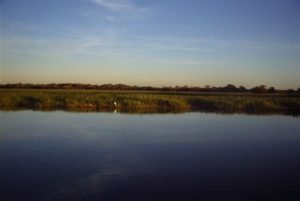 Kakadu is Australia’s largest national park, and can be entered either from Darwin on the Arnhem Highway or via Pine Creek on the Kakadu Highway. The Nature’s Way tourism drive is a great way to explore the Park. The flora and fauna found in Kakadu National Park is diverse, with pockets of rainforest, wetlands rimmed with paperbarks, pandanus and cycads and dotted with lotus lilies. 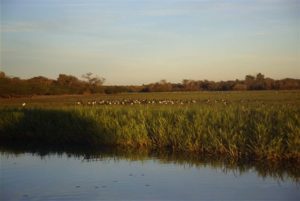 Some of Kakadu’s amazing wildlife includes crocodiles, barramundi, and birds, such as magpie geese, brolgas, jabirus and white-bellied sea eagles. Around 1000 different plant species, a quarter of all Australian freshwater fish species, and over one third of Australian bird species can be found in the Park. Kakadu National Park is managed jointly by Parks Australia, an Australian government body, and the Park’s traditional Aboriginal owners. A number of Aboriginal clans reside within the Park, and have for some hundreds of years. 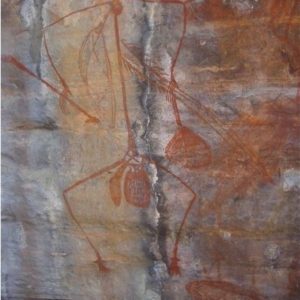 Kakadu is home to one of the largest concentrations of Aboriginal rock art in the world. 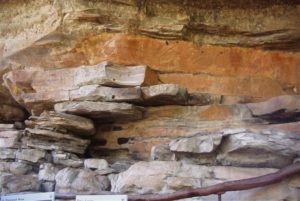 Natural galleries of these ancient paintings can be seen at sites like Ubirr and Nourlangie Rock. 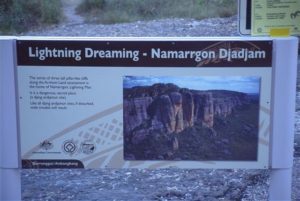 Other spectacular landmarks include Jim Jim Falls, Twin Falls, Maguk/Barramundie Gorge, Jarrangbarnmi/Koolpin Gorge and Gunlom, which means ‘waterfall creek’ in the Jawoyn Aboriginal language. 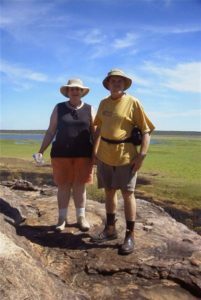 Kakadu National Park also offers several established walking tracks and camp grounds. 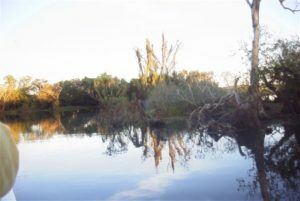 At the centre of the Park is the small mining township of Jabiru, which offers a range of services and accommodation and serves as a touring centre for the unspoiled wetlands of the nearby Mary River National Park, home to millions of birds and plentiful barramundi. 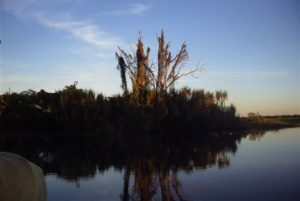 Another settlement, Cooinda, also offers accommodation, and is located on the banks of Yellow Water, a billabong teeming with migratory birds, saltwater crocodiles and other wildlife. Cruises on Yellow Water depart daily. A visit to Kakadu is best started at the Bowali Cultural Centre near Jabiru or the Warradjan Aboriginal Cultural Centre near Cooinda. 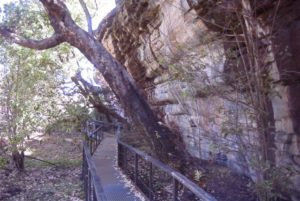 Each provides visitors a good appreciation of the Park’s traditional owners’ culture and heritage. 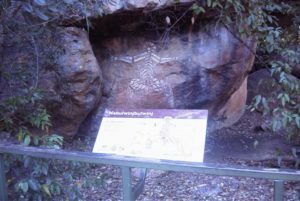 In both Kakadu and Arnhem Land you can learn about and view the many world-famous rock art galleries on a guided tour or through the comprehensive interpretative signage at many art sites. 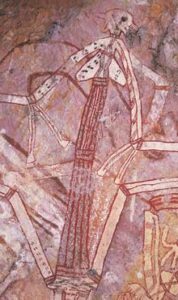 The art sites were integral to Kakadu achieving its World Heritage status with the oldest sites providing evidence of occupation many hundreds of years. 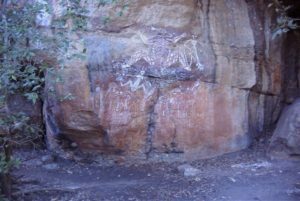 The rock art depicts the area’s social, cultural and natural history. Aside from sharing their art, Aboriginal guides enjoy teaching visitors about the daily aspects of their culture on a Park tour. Some tours explore the spectacular bush environment, searching for traditional foods and medicines while others cruise rivers and billabongs. 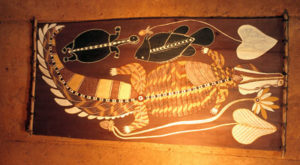 There are also a number of indigenous art galleries in Kakadu National Park, Arnhem Land and around the Gove Peninsula. The art centres are generally within Aboriginal communities and visits by travellers are encouraged. The art centres can arrange visitor permits and advise when is the best time of day to watch local artists and craftspeople create their work. Art and crafts can also be purchased. Yellow Water is the South Alligator River. Yellow Water is 7.5 kilometres off the Kakadu Highway, Kakadu. 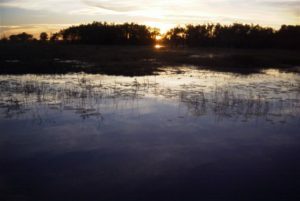 Yellow Water, a land-locked billabong brimming with native flora and fauna, is one of World Heritage-listed Kakadu National Park’s best known landmarks. 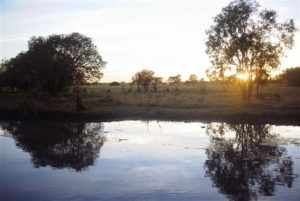 Located near the small settlement of Cooinda, Yellow Water is home to crocodiles, wild horses, buffalo and other wildlife. 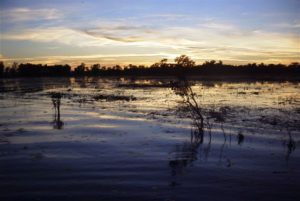 The billabong, which floods to join other waterways during the wet season, also attracts millions of migratory birds each year, including jacana, egrets, jabiru, sea eagles, magpie geese and many other native species. Paperbark forests, pandanus and fresh water mangroves line the shore, and the water is dotted with beautiful pink and white waterlilies. Explore the billabong by boarding a wildlife cruise, or enjoy an unforgettable Top End sunset from the viewing platform. A trip to Kakadu is not complete without a visit to Yellow Water. We caught an early morning cruise at 7.30 am in one of two flat bottom covered boats with fifty other people in each boat. 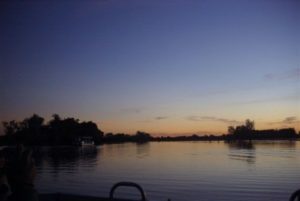 The boat cruised out along the river as the sun was slowly coming up along in the east. The water was like glass …. only broken by the wake of the boat. As we were slowly going along the river, the boat operator pointed out that in the monsoon going along the river would be impossible. The water would be 20 metres above the present height of the river and would spread out to 100 kms. over the Kakadu flood plain. The few Magpie Geese out on the Floodplain now which we could see, are just a few as there can be in thousands at the time of the season. This was the effect of the the monsoon receding. Magpie Geese out on the Floodplain …. Just a few as there can be in thousands at the time of the season. 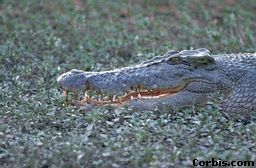 He then pointed out a crocodile sun baking on the river bank that had not yet come down into the river. You wouldn’t swim in the river because a crocodile would take you as prey for a meal. When I personally went on a guided fishing trip with fishing guide on his boat we passed a small three metre crocodile swimming under the boat about two metres down in the water. He told us a story about the interaction between people and crocodiles. One night, there were two men fishing in a boat. One man bet the the other man that he couldn’t get out of the boat and swim to shore. The man did get out of the boat to swim to shore, but they never saw him again. They must have been drinking and gotten a little bit intoxicated. Apparently, the river was called the South Alligator River back in the late 1800’s. A man from Florida, USA had come to explore the unnamed river and saw these ‘alligators’ everywhere and called it the South Alligator River. He quite familiar with the harmless alligators in the Florida Everglades. He didn’t realise they were harmful crocodiles. Fishing in the Northern Territory is world class and there are many diverse fishing habitats on offer; lush billabongs, big tidal rivers, mangrove-lined estuaries, a scattering of islands and hundreds of kilometres of unspoilt coastline. A fantastic fighting fish, barramundi is famous for high leaps and strong runs. While the ‘barra’ is perhaps the most sought-after trophy, other species like jewfish, queenfish, giant trevally, mangrove jack, saratoga, threadfin salmon, golden snapper, billfish, marlin and mud crabs thrive in the Northern Territory’s waters. Darwin Harbour, an enormous expanse of water teeming with fish, is a popular fishing spot that is easily accessed from the CBD. 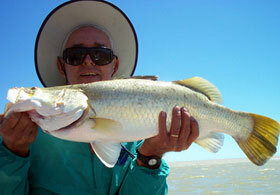 Fishing is also an exhilarating way to experience the Northern Territory’s other diverse destinations. 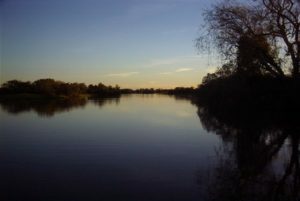 Huge, wide rivers like the Daly and Victoria are prime barra haunts, as are the networks of beautiful waterways found in World Heritage listed Kakadu National Park and the Mary River area. Anglers seeking a real adventure can travel to more remote destinations like Arnhem Land and the Tiwi Islands. Fishing in the Northern Territory is excellent all year round and while barramundi are most active from March to May, anglers can fish successfully at any time for a range of species. You can hire a boat or bring your own, take a fully-guided fishing safari, stay at a remote fishing lodge or charter a mothership – every type of angler and every type of fishing experience is catered for in the Northern Territory. I personally went on a guided fishing trip with fishing guide on his boat. I was with two other people trolling along the South Alligator River for two hours in the afternoon. The guide supplied all rods and lures. You had to flick out the lure and gently weave the tip of the rod up and down so that the lure would have a jerking movement while being trolled along behind the boat. I caught one barramundi which checked in at 51 centimetres. I had to throw it back as it was to small. 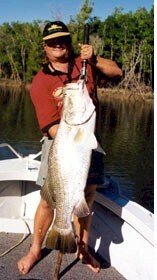 The legal length for barramundi is 55 centimetres. The other man caught one at 58 centimetres …. it was legal. We all caught several other smaller barramundi at about 40 centimetres and had to throw them back. Some barramundi can get up to a metre in size in these rivers. 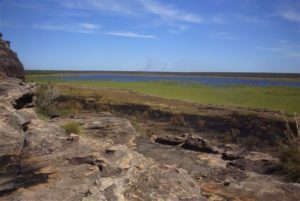 Obirr is one of the most significant art sites in the Park and a small climb provides unmatched views of the floodplains and Arnhem Land escarpment. The Northern Territory is like a complex patchwork quilt of diverse Aboriginal cultures. There are hundreds of different languages, customs and laws, each woven together to tell a story that is more than many hundreds of years old. 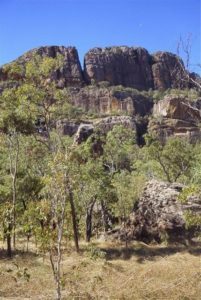 Many of the national parks (including Kakadu, Uluru and Nitmiluk) are owned and jointly run by their traditional people. 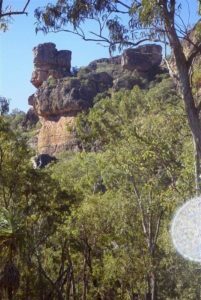 Visitors can join an Aboriginal guide for bushwalking and bush tucker tasting and hear the stories behind sacred sites. 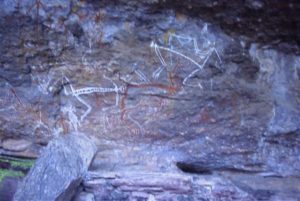 The natural galleries in many of these parks have some of the most famous Aboriginal rock art paintings in the world. The more aesthetically minded may choose to invest in local indigenous art. In some local galleries, you can even meet the artist and see them at work. Enjoy indigenous dance and music by one of the Northern Territory’s many modern and traditional performers. 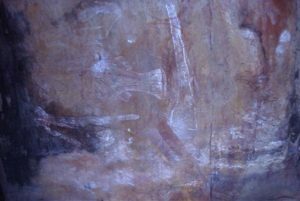 The Aboriginal people have traversed this land for many hundreds of years and their Dreamtime stories, dance and paintings will help you see Australia in a different light. They invite you to visit their land and experience their culture. A visit to Kakadu is best started at the Bowali Cultural Centre near Jabiru or the Warradjan Aboriginal Cultural Centre near Cooinda. Each provides visitors a good appreciation of the Park’s traditional owners’ culture and heritage. 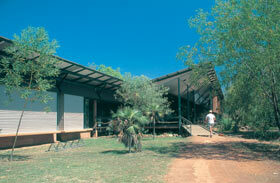 Before you start exploring Kakadu National Park, get familiarised by exploring the Bowali Visitor Centre. Spend an hour at the interpretive centre where you can watch a 25 minute audio visual presentation to help you gain a greater understanding of Kakadus landscape and moods, then take a walk through the interpretive displays. 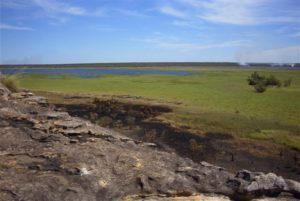 Videos are shown on the half hour giving different perspectives on Kakadu and its international significance. The habitat based display and library gives you detailed information about the park and how much there is to see and do. Take a look at The Marrawuddi Gallery for Aboriginal arts and crafts, books and gifts, and then enjoy a coffee at the cafe. To understand something of the connection Kakadu’s Aboriginal owners have with this special part of the Top End, spend some time at the Warradjan Cultural Centre learning the stories that gave them their laws. Start with how the first people created the land, plants and animals. Aboriginal people developed this centre so they could share their culture. The Building has been styled in the shape of a pig nosed turtle, Warradjan, and is based on the theme, out land is our life. Allow at least an hour to view and appreciate this attraction. Located in Cooinda, the Warradjan Aboriginal Cultural Centre’s architecture represents the story of World Heritage-listed Kakadu as told by the traditional owners. The circular design of the centre symbolises a warradjan, the pig-nosed turtle. 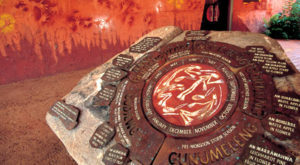 The Centre was developed by the local Aboriginal people and interactive displays provide information on their culture and history. 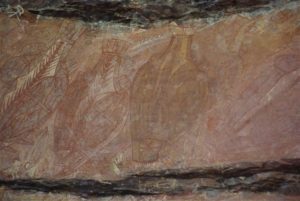 The walls of the Nourlangie Rock Art Site, in World Heritage-listed Kakadu National Park, have served as a shelter and canvas for thousands of years, providing windows to a rich spiritual tradition. Paintings such as Namarrgon, lightening man, explore the relationship of the people to their country and beliefs. 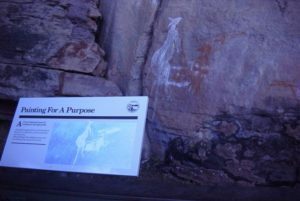 The paintings at the base can be reached by the circular one and a half kilometre Nourlangie Rock Art Walk. During the months of April until October, Park Rangers invite visitors to join them and share their knowledge of this ancient gallery. There is a lookout that is well worth the climb for sweeping views of the escarpment. 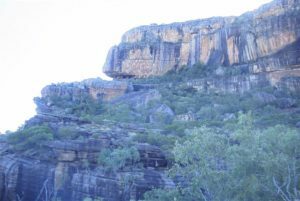 For the more adventurous, there is also a moderately steep climb to Gunwarddehwardde lookout which provides impressive views of both Kakadus escarpment and Nourlangie Rock. 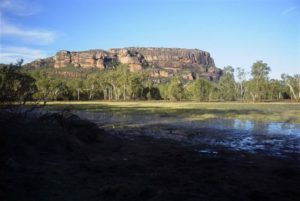 Nourlangie Rock in the background with Anbangbang Billabong in the foreground.